Airport pick-up: Casablanca Mohamed V airport. In Casablanca we will visit the Hassan II mosque, the largest mosque in North Africa and the third-largest in the world. It is situated on a headland on the Atlantic Ocean. The minaret is 210 meters. This makes the mosque visible from the outskirts of Casablanca. Another amazing place to visit is the Old Medina where you will enjoy everything traditional. 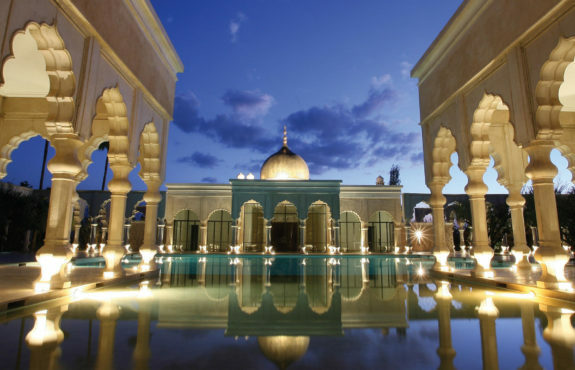 On the other hand, there is the New Medina which is a wonderful mix of French and Moroccan inspired architecture. We leave then to Rabat, the administrative capital of Morocco and the modern, spacious and wonderful city. In this imperial city, we will visit the Hassan Tower, Chellah, the Oudaya Kasbah and the art galleries. We eat lunch in Rabat then later in the afternoon we drive to Meknes. We spend the night in a riad. In the morning, we depart to Chefchouen through Ouazzane. On the way we stop in the Roman ruins. We visit the site with a local guide. We move to Chefchaouen, the “blue pearl” of Morocco. It is a perfect place to wander and take photos. You will enjoy the medina’s beautiful blue alleys, shops and bazaars and you will love the relaxed ambiance as it means they can stroll at leisure and appreciate the local leather products for which Chefchaouen is best known. We stay in riad. After breakfast, we drive to Fez through the Rif Mountains where valleys, gorges and picturesque peaks are in abundance. We get also through some Berber villages. We stay in Cordoba riad. After an active day, we take you back to your Riad . After breakfast, we depart to Merzouga. On the road we cross several Berber towns such as Imouzzer Kandar (a small town in Sefrou Province), then Ifrane (a summer resort town in the Middle Atlas Mountains). We move on to Azrou cedar forest to watch monkeys and take pictures. Then we head to Midelt where we will have lunch. In the afternoon, we carry on to Merzouga through Errachidia, Erfoud and Rissani. We spend the night in the hotel. Here, we will explore Merzouga and its suburbs. We tour the sandy dunes of Erg Chebbi which stretches on an area of 50 kilometers from north to south and up to 5–10 kilometers from east to west lining the Algerian border. This natural gift inspires locals and guests with its 150 meters high dunes. You will enjoy the beautiful sunrise and sunset. In the same day, we meet nomad families who take care of their sheep and camels. They live in tents and they depend on grazing to win a living. We head, then, to Rissani to visit the local market and to explore the ancient villages. Nearby Merzouga, we listen to Gnawa music. We drive back to the hotel to start the camel trekking. You ride your camel to the bivouac where you will have a chicken Tajine and you sleep under wool tents. Meanwhile, you will enjoy the Berber music with our team and a superb view of the starry sky. In the morning, before you miss sunrise, we wake up to enjoy the sunrise and picture that lovely moment. We, then, ride our camels back to the hotel.You take a refreshing shower and a great breakfast. We leaveto Rissani where we make a short visit to the local market. We continue via Alnif to Nekoub where we stop for lunch. This is where you enjoy the pure atmosphere of the Sahara. We head to Ouarzazate. We spend the night in the hotel. Today, after breakfast, we drive to Ouarzazate, the Hollywood of Morocco. We visit the Taourirt Kasbah and, then, we drive to Ait Ben Haddou village which is a UNESCO World Heritage Site and which holds the most impressive Kasbah in Morocco. Filmmakers have flocked here in recent years to film blockbusters such as Game of Thrones, Gladiator, Kingdom of Heaven and many other movies. After lunch, we drive to Marrakech through the high Atlas Mountains. We spend the night in a riad. Today is devoted to explore the red city of Marrakech. We will visit the Souks and Markets which can be the best experience you could ever have in the city. Djemaa el Fna is the popular city square in Marrakech, often known as the heart of Marrakech. It attracts tourists from all over the world. The Saadian Tombs are grandly decorated with vibrant tiles, intricate carvings and Arabic scripts. They have been restored and designed lavishly. You’ll be amazed at the beauty of these tombs, the magnificent arched ceilings, marble and mosaics carvings. On our tour, we will also visit the Koutoubia Mosque, the Bahia Palace, and the busiest streets of the Medina. In the afternoon, you might go for a walk and enjoy the open spectacles of the Djemaa el Fna where you attend nonstop performances of musicians, acrobats, story tellers, snake charmers and more. We spend the night in a riad. This extraordinary itinerary combines two of the most tourist attractions in Morocco. From the charm of “the red city” to the vibrant “windy city” of Essaouira, you will take a trip of your dreams. After breakfast in Marrakech, we will drive to Essaouira, a port city on the Atlantic coast .The Medina of Essaouira was listed as a UNESCO World Heritage Site in 2001.It is small but that means it’s perfect for exploring. Shops are lined along the streets. They are full of colorful blankets and rugs, wooden handicrafts and other masterpieces of artisanal work. We will go to see the port and spend some time at the wonderful beach. You will enjoy all that. At the end of our journey here, we leave to Marrakech. We take our dinner and stay in riad. Copyright © 2017 Morocco ML Tours. All rights Reserved.